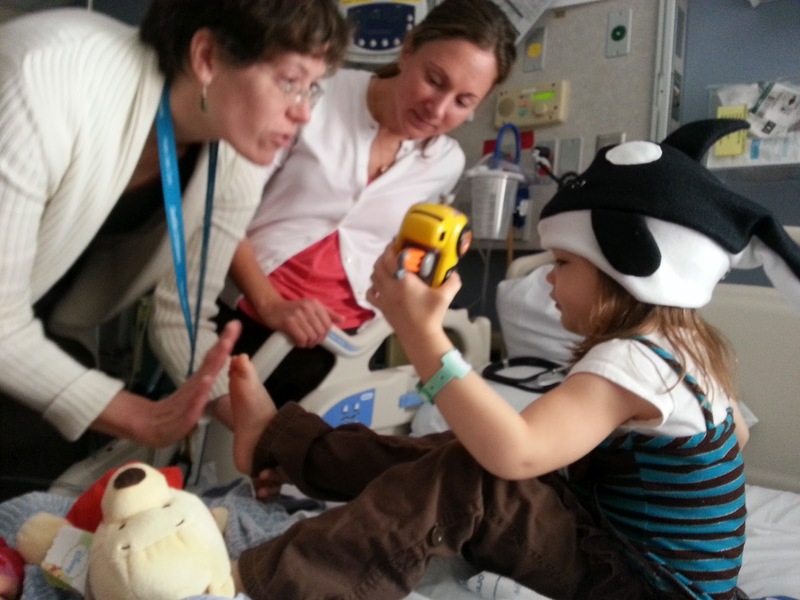 Shoshana was discharged from Seattle Children's Hospital on Sunday afternoon. This was a day or two earlier than we had been expecting, but a welcome surprise. She was off of her IV in the morning, so she and I got to ride bikes through the unit halls together (previously, I was always wheeling her IV cart and minding her line). Once we got home, everyone went down for a much-needed nap. 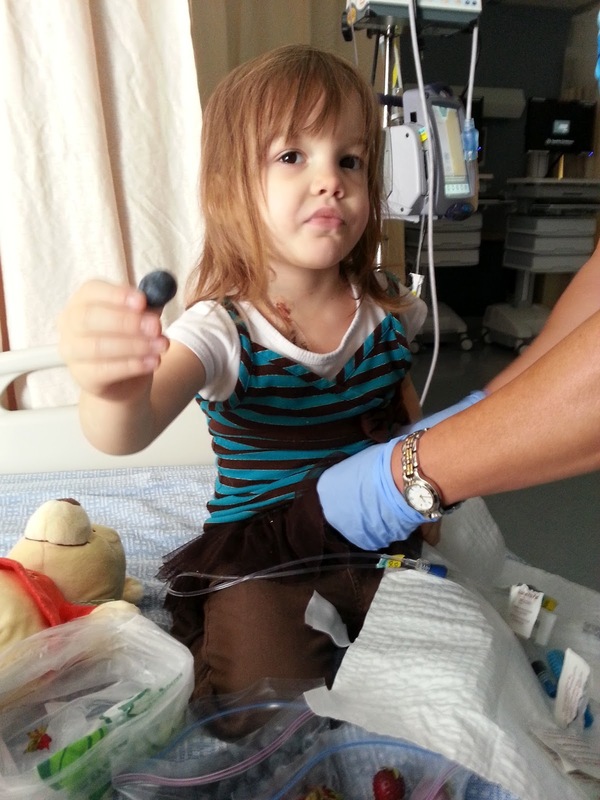 First, her immune system is suppressed. Elizabeth and I are not at all germophobic, so this is definitely an adjustment, but one that we can certainly make. Shoshana can no longer go out in the back yard with the goats (and their poop on the ground). We need to pasteurize the goat's milk before she drinks it. We need to be careful with bacteria in foods: certain kinds of foods are out; others simply require more care or preparation. No sharing dishes or utensils, no buffet foods, no probiotics (normal yogurts and non-soft cheeses are fine, as long as they are from pasteurized milk). We also need to be extra careful not to expose her to anything: visitors can't have been sick for three days, or exposed to anything at home. We can't take her out anywhere with crowds of people. This includes shopping, playgrounds, the fair, church, etc. Her white blood cells won't be able to respond to an infection, so a fever is the only sign that we will have if she gets one. 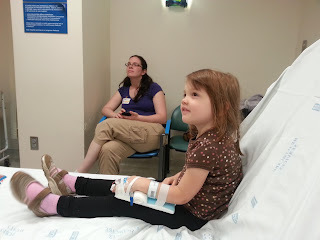 We need to monitor her closely, and be prepared to take her to the hospital immediately if she spikes a fever. For the most part, these are pretty manageable. Not very convenient, but manageable. 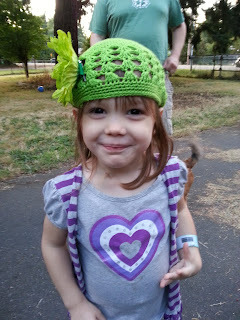 Shoshana shows off her new beret. Second, she is on a regimen of medications. This is turning out to be difficult for Shoshana. When she was in the hospital, most of her medications came through her IV line, though not all of them. Some she needed to take orally. She's too young to swallow pills, so this means she got a liquid syringe squeezed into her mouth. 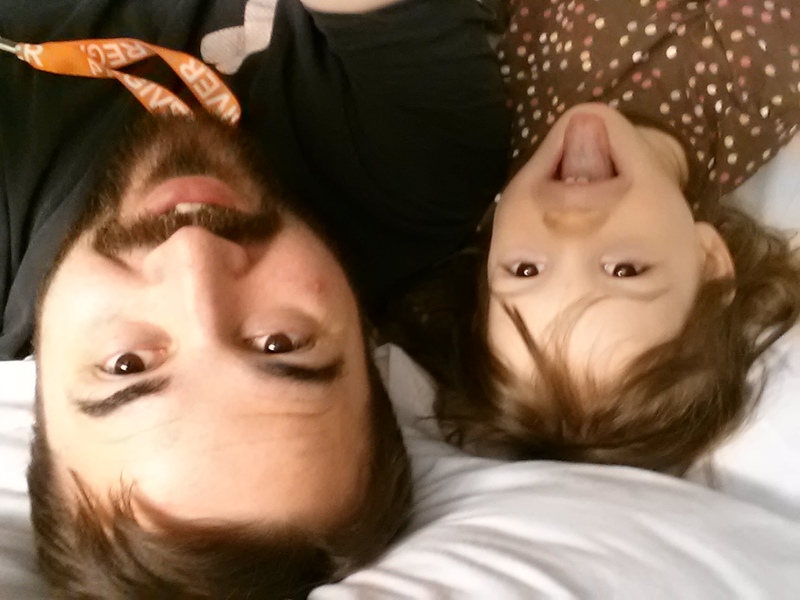 Initially at the hospital, she was okay with this. However, some of these medications don't taste very good. After taking a particularly bitter pink medicine syringe, she proceeded to throw up her entire stomach contents. Her nausea was probably not entirely due to the flavor of the medication, but she immediately associated it with that flavor, and all syringes of medication (especially pink), even the sweet-tasting ones. She insisted that the medications were hurting her; they made her sick, and they were all yucky and vomit-inducing. She managed to get her medications down on Sunday night. Monday morning was a battle. Monday evening, she again emptied her entire stomach (a rather large helping of delicious beef and lentil stew made by her grandmother). As best I can tell, what made her vomit was not the food or medication in her stomach. It was her panicked reaction to being made to swallow "yucky" medicine. The battles were a drain on everyone, but especially on Elizabeth. 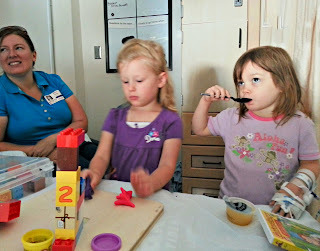 Tuesday was our first outpatient clinic visit, and we brought up the problem with the doctor. She suggested that we could get pills instead of liquids, and crush them and put them in different things to see what would work. Some of the pills were easy enough to conceal in food, others not. Wednesday morning was the last straw for Elizabeth. 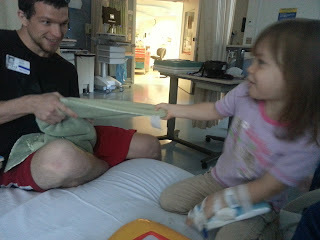 She did not want to fight Shoshana for every dose of medication. Shoshana was starting to become suspicious of everything that we asked her to eat. She would refuse to eat what we offered, and make demands for other things. 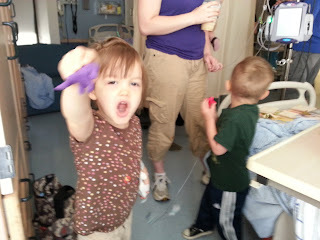 Elizabeth had been advocating for a nasogastral tube since before our clinic visit on Tuesday. She had had nothing but good experiences with it in her nursing career (she has not worked in pediatrics), and we had seen many other children in the hospital with n-g tubes. 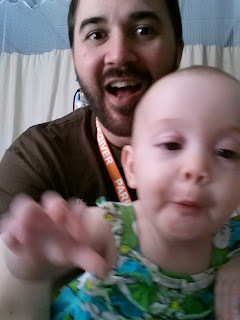 I agreed that we should call and ask to come in to the clinic (again) today to have a tube inserted. We did our best to explain to Shoshana what the tube was, and that its purpose was so that she would not need to taste any of the medicines. Nevertheless, she freaked out. The tube cause her discomfort, and she refused to be consoled. She screamed and cried for hours. She was finally able to get some sleep, and is eating some noodle soup as I write this (praise the Lord). Shoshana with her n-g tube, finally comfortable enough to eat. Still not very comfortable. Comfort and peace for Shoshana. That she will be given understanding and courage. So much has been asked of her, and she has taken so much in stride. No three-year-old should have to go through this kind of thing, but she must. A solution to the medication dilemma. We are hoping that Shoshana will adapt to the presence of the tube, but it may take a few days, and in the meantime it affects her swallowing and breathing. 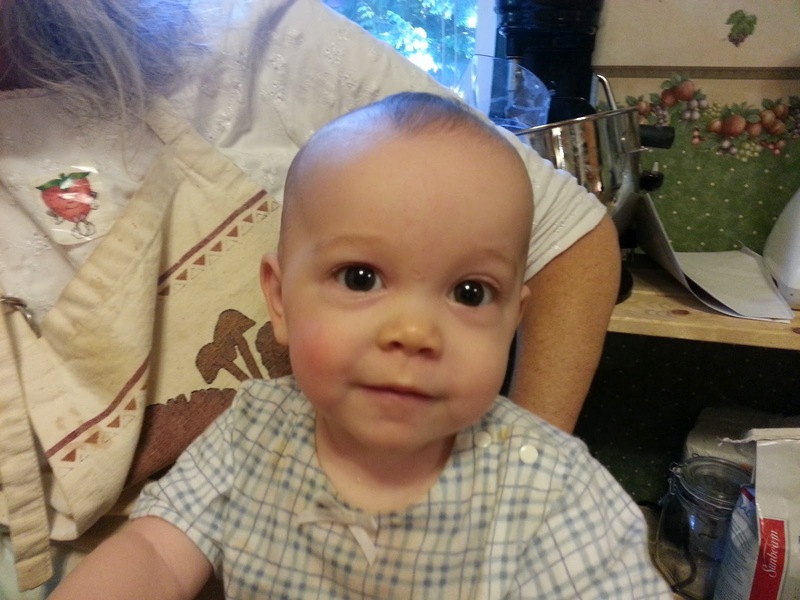 We would prefer not to put Shoshana on anti-anxiety medication, just so that she can take her medication. Comfort and peace for me and Elizabeth. 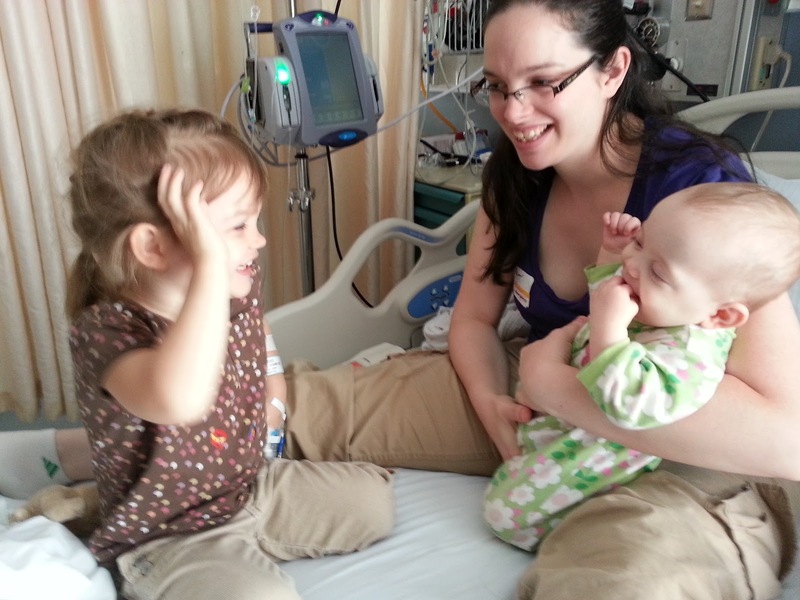 Shoshana's leukemia is as much or more of a life-change as having our first baby, and far less anticipated. We are very thankful for those who stepped in to care for our 8-month old Abigail, and our household needs during the hospital stay. Meals. A meal plan is being arranged through our church. The clinic visits are exhausting, as is dealing with a frightened, cranky three-year-old on steroids (literally). 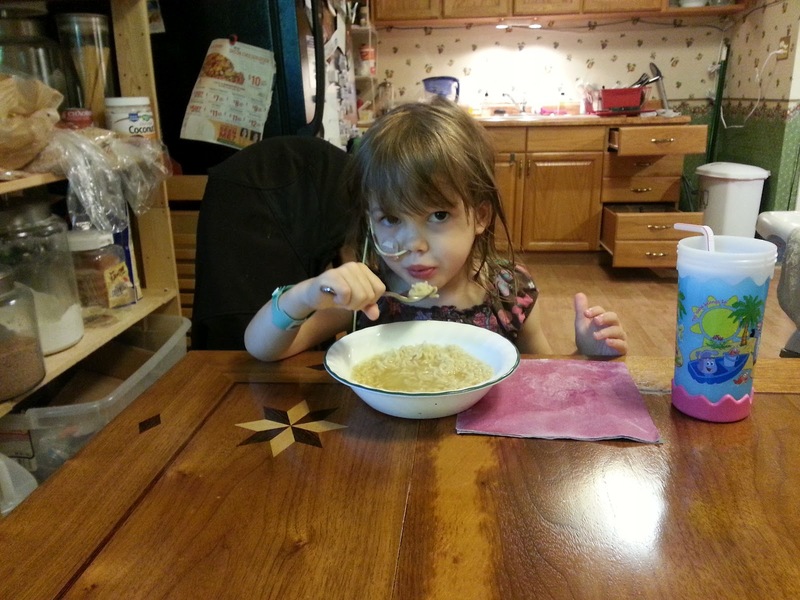 Worrying less about meals means we are more available to meet Shoshana's other needs. There are a few considerations for bacteria (and we want to avoid pesticides on produce), but other than that, we are not too picky. 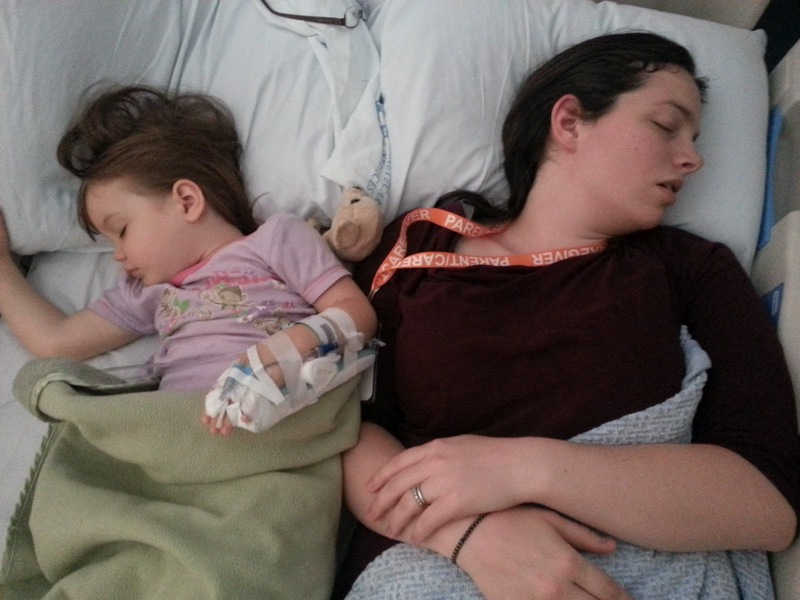 Breaks and gofers: There are errands that Liz can't take Shoshana on because of her compromised immune system. I would also like to take Liz on a date at some point. This is more complicated than simple babysitting, since whoever looks after the girls needs to be brought up to speed on what to watch for, and how to respond. We can't always accept visitors, and there are some sanitary restrictions (see above), but we definitely appreciate visitors: both visitors Shoshana's age, and grown-up visitors. It's nice to have grown-up time when we can get it. I have taken last week and this week off of work. I don't have very much sick leave, but I do have some vacation time built up. 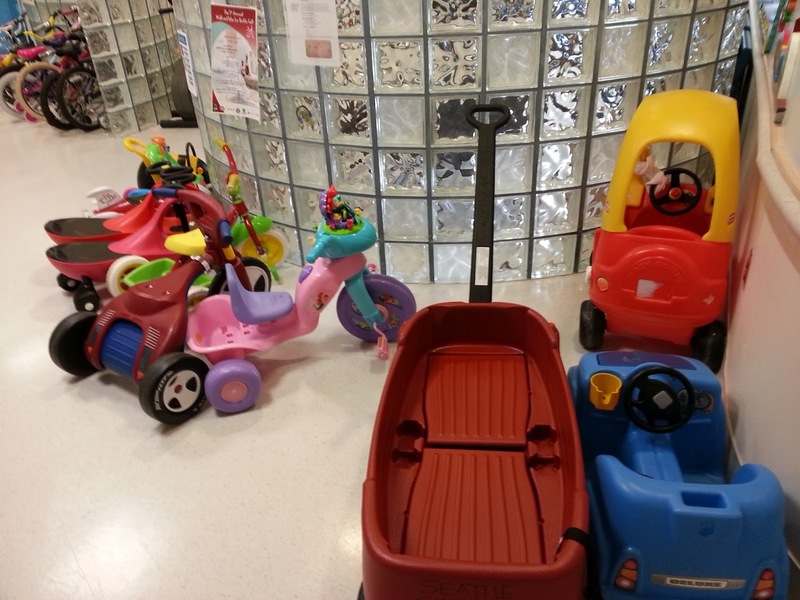 I'm not sure how we're going to deal with all of the clinic visits this month. I can get family leave time off work, but I won't get paid unless I have vacation or sick leave to cover it. 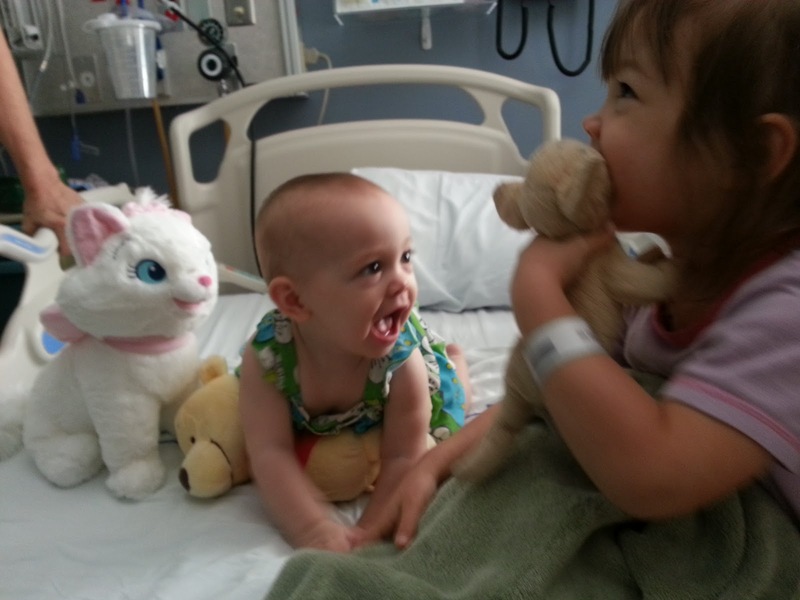 If someone else can take Abigail, Elizabeth and her mom can be with Shoshana at the clinic. At this point, I don't want Elizabeth to have to bring her alone. Our daughter Shoshana, who turned three in June, was diagnosed with Leukemia on Friday. She had been having pain in her bones at night, and we took her to the doctor, suspecting it was arthritis, the blood test that provided the diagnosis was from those tests. 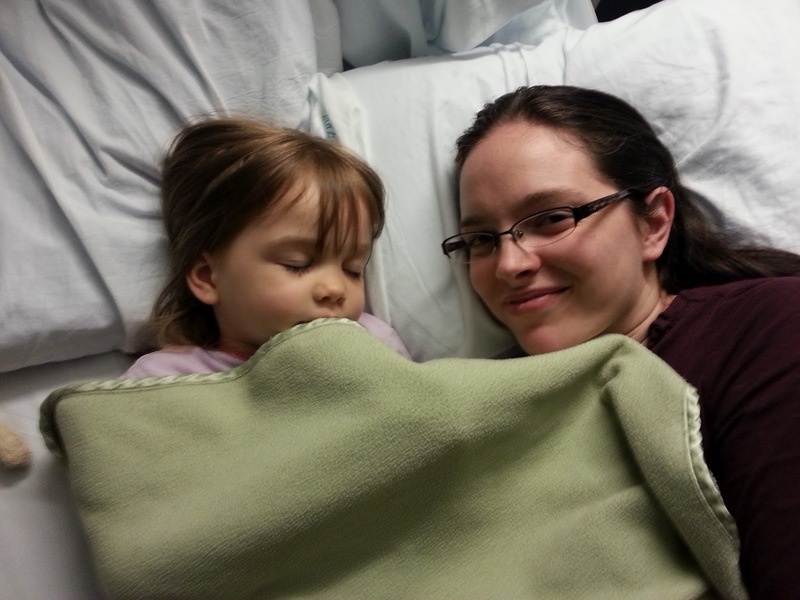 We admitted her to the hospital immediately (Friday evening). 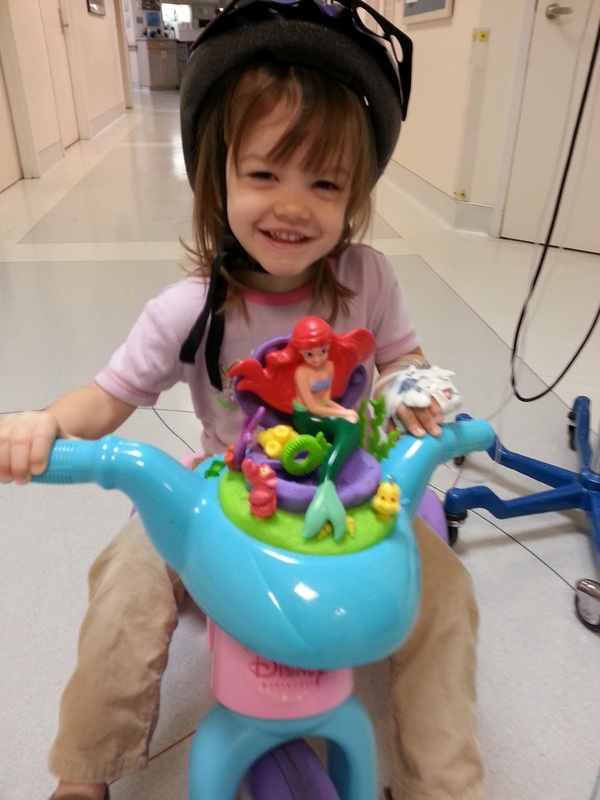 She developed a fever while in the emergency room, and was immediately put on antibiotics. 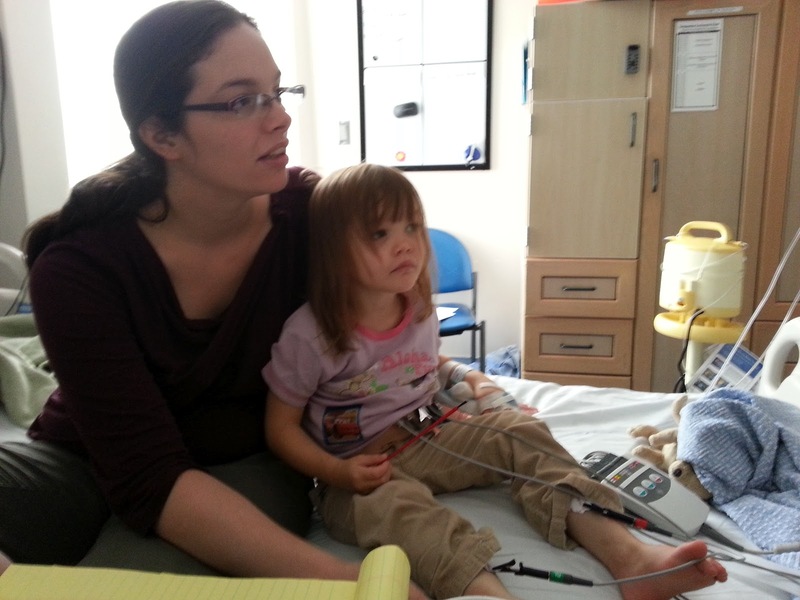 Over the next few days (and continuing), her tests would show rapidly declining blood factors. Basically, we detected it just before it got very, very serious. 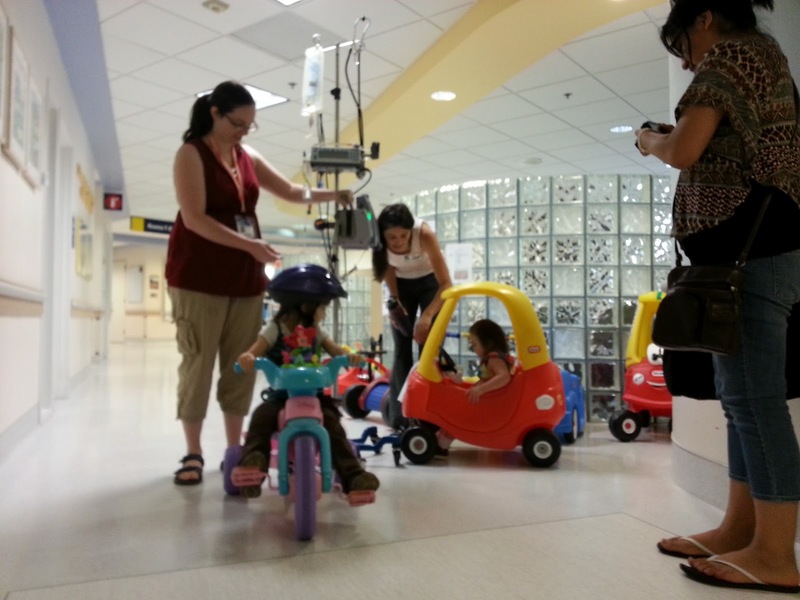 The type of Leukemia she has is ALL, which is the most common type for kids. Leukemia is a particularly tough cancer to eradicate, and so Elizabeth and I both agreed that she should immediately start chemotherapy. The 'cure' rate for kids with ALL is 90%. (Cure means remission and no relapse within five years. I'm not sure what the relapse rate is beyond that). 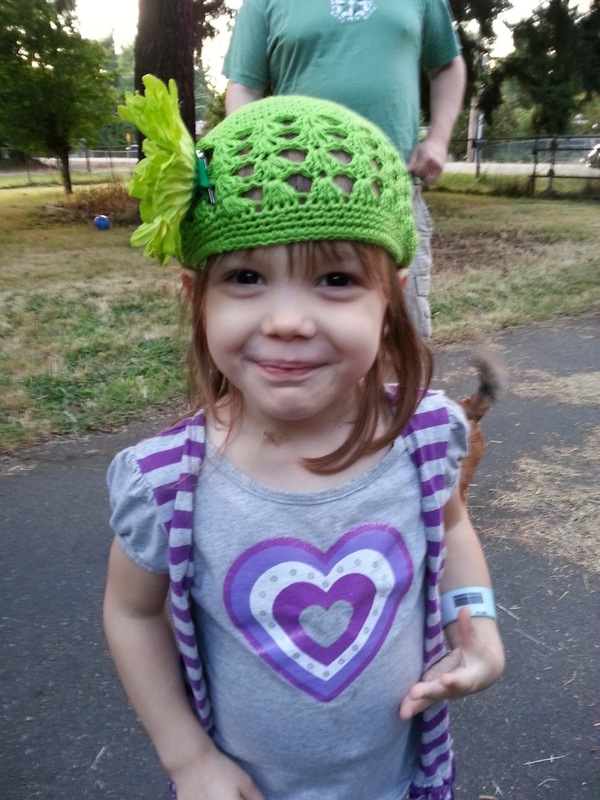 Shoshana's leukemia was caught early, and so we are hopeful that hitting it hard (but not too hard) with chemo will eradicate it from her body. It was still a tough decision. It's not easy to pump your child full of poisons that kill rapidly-reproducing cells. She kind of needs some of those, you know, to grow up. It breaks my heart that anything could make Shoshana be any less herself. We were not offered the option of a cancer-free Shoshana. There was no such box for us to check. I'm still not sure how this will affect her adult life. I do want her to have an adult life if at all possible, and the rest of her childhood, and I know that she is in the Lord's hands. He wants her to be every bit of herself that she possibly can be too, and He can and will make her so, despite cancer (which He hates more than we do), if she will let Him. Please pray for Elizabeth and me as we point her to Christ. May He work in and through our hearts, in and through this difficult time. The Lord is good. She was asymptomatic (except for occasional bone pain) when admitted. The detection at this stage was a complete fluke. She has no cancer cells in her spinal fluid. She has had some rough times, where she has been uncomfortable or in pain, but she has also had times every day when she is her normal, infectiously happy, silly, serious, adventurous, adorable self. 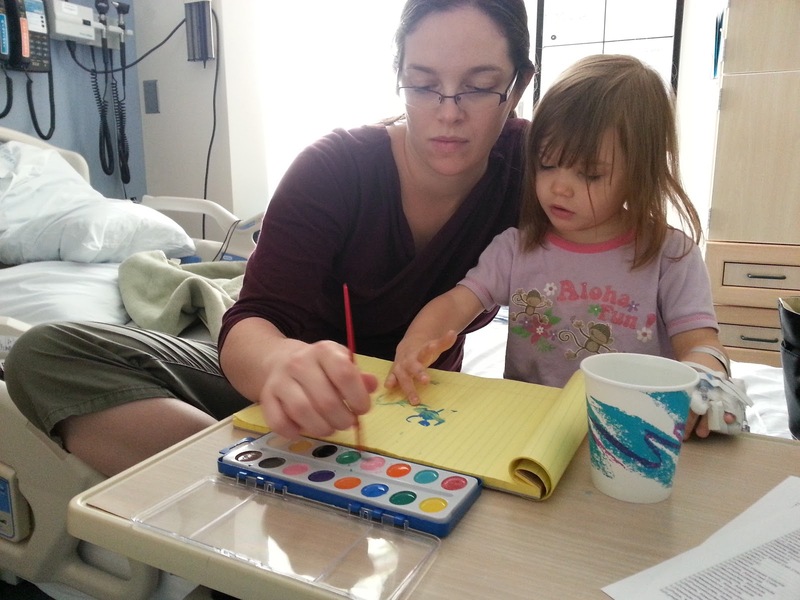 Her pain is in the same places as it was before (her thigh bones, mostly), leading us and the doctors to speculate that the chemo is working on those cells which were previously crowding out her healthy bone marrow space. Part of her therapy is a steroid, a major side effect of which is that she is prone to extreme irritability when agitated or in pain. It's hard to see our sweet little girl transformed in this way, but the effect is temporary, and it is not her real personality. We are still holding her accountable for her behavior, so that she will not develop bad social and relational habits. She has had several friends and family members visit. She loves visitors. We have found that distraction works very well for her pain and irritability (she has always been a socialite), and can break up the monotony of the day. 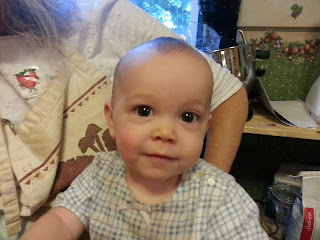 Elizabeth and I have been blessed by so many friends (and even strangers) praying for us, and serving us in other ways. Kristen (Elizabeth's mom) has basically taken over the care of our 8-month old, Abigail, enabling us both to focus on Shoshana. Our nephew Josh is staying at our house and milking our goat twice a day, enabling us to both be here more and focus on Shoshana. Several friends have brought us meals. This has freed us up so that we can both focus on Shoshana. Are you noticing a pattern here? Visitors, particularly friends her age, especially if they bring interesting toys to play with, but we also have toys here, and she *loves* to ride the wide variety of bikes and cars that are available to the kids (and their visitors) here. Her immune system is compromised: *don't* come if you are sick in any way, or if you have been exposed to someone sick. Movies: Shoshana has a stack of DVDs that she loves to watch. Mostly Disney cartoons and How to Train Your Dragon. Fresh fruit (especially berries): Shoshana loves fruit. Too much pain will overcome her desire to eat, but when she's hurting a little, eating something tasty can help distract her from the pain. Also, it's very healthy, which she needs especially right now. Please make sure any fruit is well-washed. Her blanket and her doggy. She has a special green blanket and a well-loved stuffed chihuahua, which she has named Parsley, in honor of our friend Amanda's dog. It goes without saying, but I will say it anyway: her Mommy and her Daddy. Liz has stayed with her every day and slept with her every night. I have taken the week off work to be here every day. I tried sleeping in a fold-out chair the second night, but determined that I sleep better if I drive home, and it enables me to shuttle things back and forth, and to attend to and observe household needs. 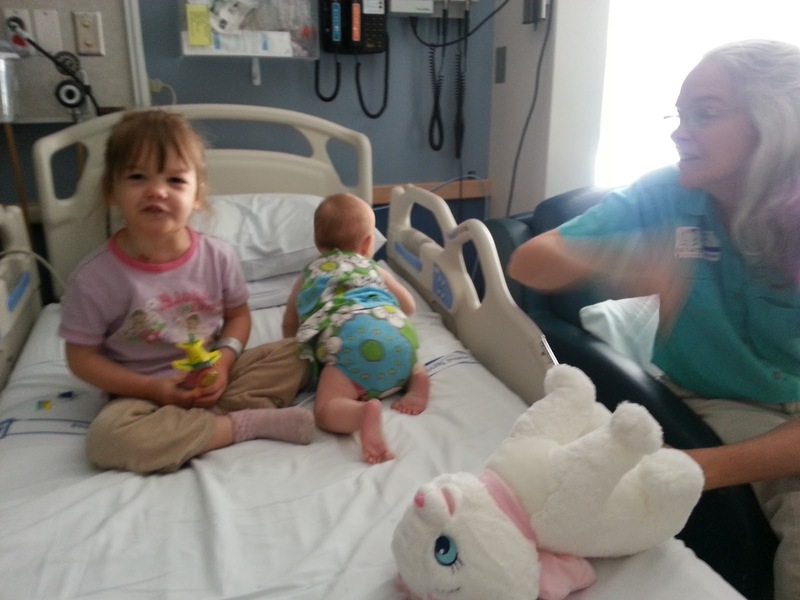 Freeing up Mommy and Daddy helps Shoshana. As I have said, we are very thankful for those who have helped in this regard. Activities. A friend of mine who is not in town asked how she could bless Shoshana. My response was to ask her to provide Elizabeth with ready-made activities and crafts to do with Shoshana. 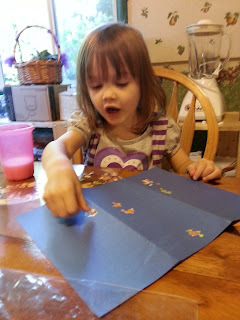 She loves sticker books, and pre-cut decorating crafts. 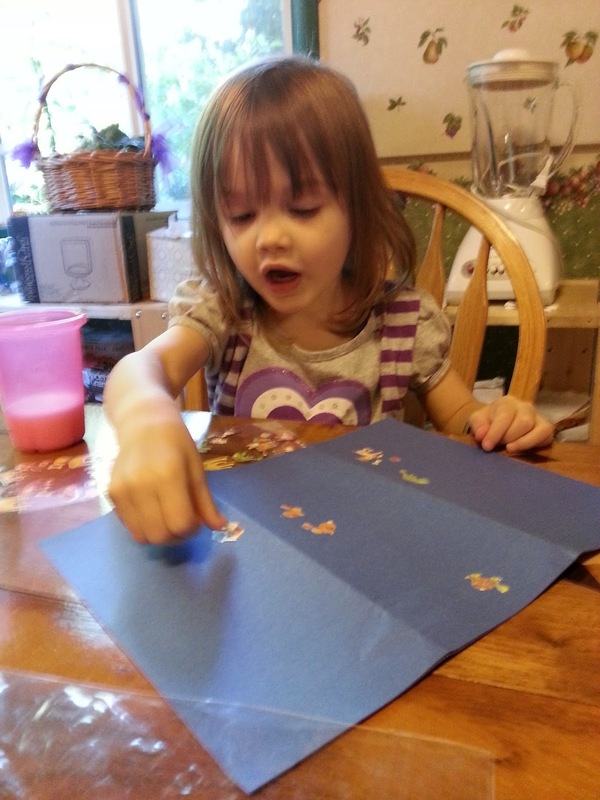 She loves Dora the Explorer, Avatar: the Last Airbender, Disney princesses, painting, Play-dough, etc. I am thinking particularly of the time after she is discharged from the hospital. Her treatment will be mostly outpatient after the initial stay, and she will continue to suffer the side-effects of the medication at home. Hopefully it won't be as extreme, but she will at times still feel sick, be in pain, and be extra irritable. She will also not be able to go outside as much, or go out in public or visit friends as much. Distractions (especially laughter) are the best medicine, with no negative side-effects. Music. 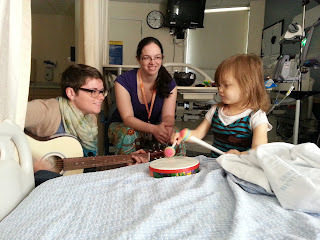 A music therapist came by on Wednesday, and Shoshana LOVED LOVED LOVED it. She played the guitar and sang, while Shoshana accompanied her on the drum. They made up a song together about an elephant named Horton, who was as huge as a bird, and visited his animal friends. Shoshana was in tears when it was time for her to go. Thankfully, some friends were arriving at that very moment. The doctors, nurses, and other staff at Seattle Children's Hospital are amazing. Both in working with Shoshana, and in dealing with us, I have been impressed by their concern, care, knowledge, communication, and professionalism. I'm very thankful that Elizabeth is a nurse, and is able to natively absorb all of the information coming our way, but I have been able to understand and participate in it all as well. 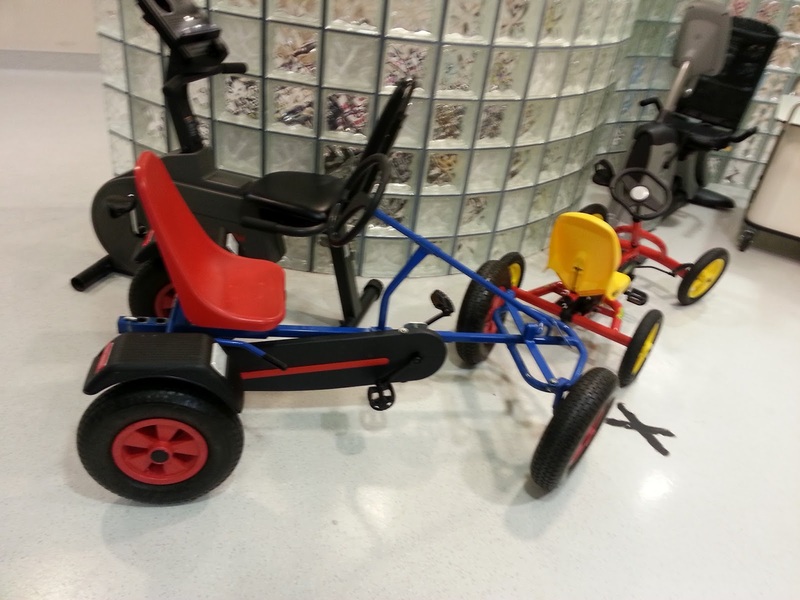 The facilities and atmosphere are amazing for kids and for families. There is enough room in the rooms for us to stay by Shoshana's bed. There is refrigerator and frreezer space designated for our use. There are free laundry facilities, and a Family Resource Center with plenty of space and chairs for comfortable socialization and relaxation. (Elizabeth is even scheduled for a massage if we are still here on Tuesday). There are bikes, trikes, and cars for the little kids Shoshana's age, there are video games, foosball tables, etc for teenagers. The hallways are all attractively and interestingly decorated. Shoshana's favorite spot to bike to is a castle painted on the wall where, as she says, The Beast and Belle live. Everything I have heard and experienced tells me that this is the best place for us to be, about half an hour from our house (in good traffic). We have so much to be thankful for. I am not afraid of losing her: it is not even the most likely outcome, as I feared when I first heard the word "leukemia", but I know that we are doing the best thing for her, and the Lord will still be faithful to us, even should He take her from us. We are in His hands, and they are good. That was longer than I thought it would be. This is the first time I've sat down and written it all out.